Sheffield Climate Alliance's River Rally took place on Sunday 21st September to link in with the huge People’s Climate March in New York to lobby the UN Summit on Climate Change. There were over 1500 events all over the world happening on the same day. 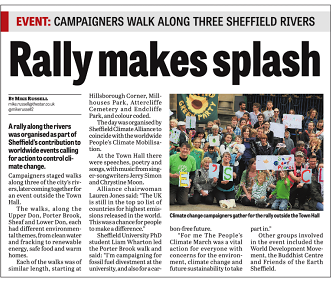 In Sheffield over 30 groups, including Sheffield Friends of the Earth, walked along the 4 rivers to meet in the city centre for a rally at 3pm. Each river walk was represented with a colour.